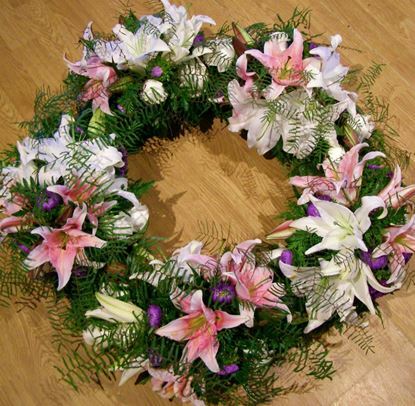 Fully decorated Funeral Wreath with white lilies, roses and green flowers-3 sizes available. This fully decorated Wreath is a symbol of lasting love and kinship, whether for the deceased or in comfort of those suffering from a loss. 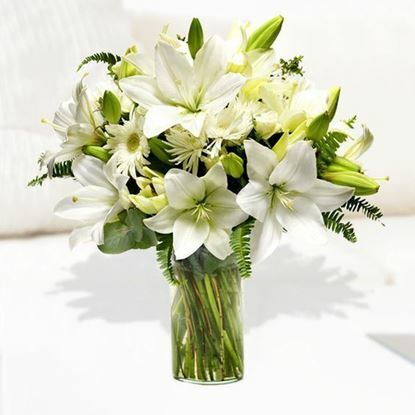 Elegant white lilies, roses, green moms and more. 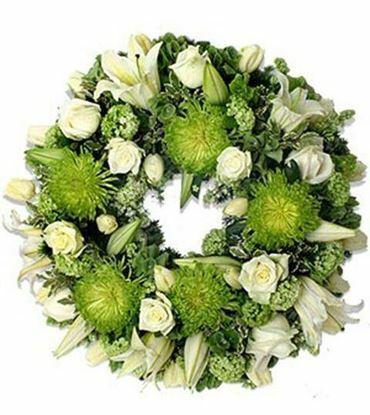 All is perfectly arranged in the form of a wreath, to create a beautiful way to display your sincere sympathy. Displayed on a wire easel. This arrangement is appropriate to send to the funeral home and Churches. This item qualifies for FREE SHIPPING in Reykjavik! Price includes printed ribbon. Fully decorated Funeral Wreath - with white lilies,roses and moms. This fully decorated Wreath is a symbol of lasting love and kinship, whether for the deceased or in comfort of those suffering from a loss. Elegant white lilies, roses, moms are perfectly arranged in the form of a wreath, to create a beautiful way to display your sincere sympathy. Displayed on a wire easel. This arrangement is appropriate to send to the funeral home and Churches. This item qualifies for FREE SHIPPING in Reykjavik! Price is without printed ribbon. 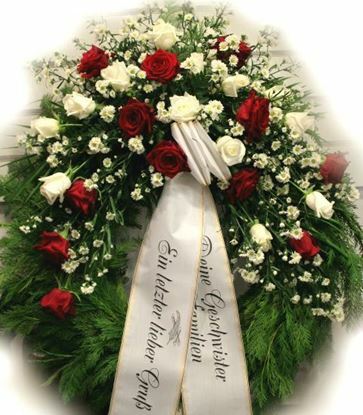 Funeral Wreath with one decoration with white and red roses, white aster and more-3 sizes. This elegant wreath conveys your heartfelt sentiments and high regard for your departed loved one. Appropriate for men and women of any age. White and red roses create are arranged among variety of lush greens, forming a wonderful representation of a life well-lived. 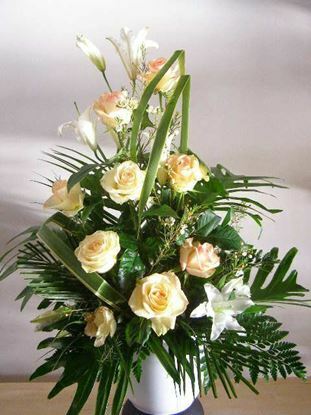 All of our funeral arrangements are professionally arranged by skilled florists. Displayed on a wire easel. This arrangement is appropriate to send to the funeral home and Churches. This item qualifies for FREE SHIPPING in Reykjavik! All-white mixed flower bouquet features white lilies, chrysanthemums with assorted quality greens which makes it a favourite gift to offer for congratulations, for graduation, engagements, bridal showers, new baby, or even a gift of sympathy. Our Memorable red roses & white Lily Bouquet is blooming with gorgeous grace to celebrate love and life. The winning colour combination of red and white. This stunning flower bouquet has been picked fresh for you to help you celebrate Christmas, birthday, anniversary, or convey your message of heartfelt love and affection. 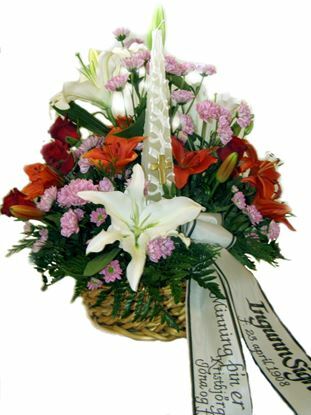 This bouquet includes the following: roses, lilies, and an assortment of lush greens. Sympathy flower arrangement in a basket with candle. 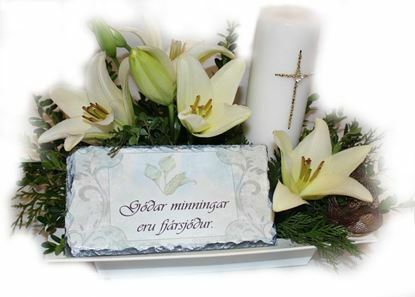 Special sympathy flower arrangement with candle and printed tile. White and cream coloured bouquet with lilies, moms, daisies and more.. 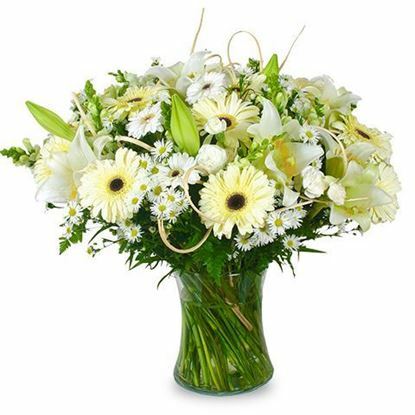 Simply astonishing bouquet with white-cream coloured gerbera, white lilies, chrysanthenum and greenery which makes it a favourite gift to offer congratulations for graduation, engagements, bridal showers, new baby, or even a gift of sympathy. Classical white bouquet with short stemmed roses, eucalyptus and more. The beauty of white roses is unchallenged. Representing innocence, their versatility makes them a favorite gift to offer congratulations for graduation, engagements, bridal showers, new baby, or even a gift of sympathy. 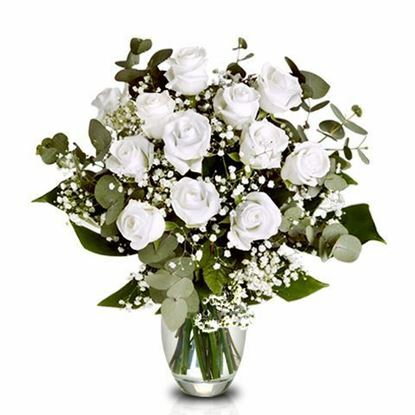 Show someone you care with this elegant composition of white roses, baby breath, eucalyptus and greenery. Length of roses is average 35-40 cm.